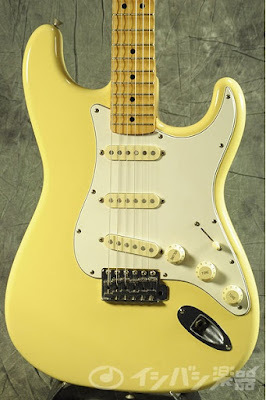 Watching a couple of Deep Purple and Rainbow videos recently had me hankering for a Strat with a scalloped fingerboard. Preferably one in Olympic white, with a rosewood fingerboard and black Seymour Duncan Quarter Pounder single coils. Just like you-know-who used to play before he went medieval. 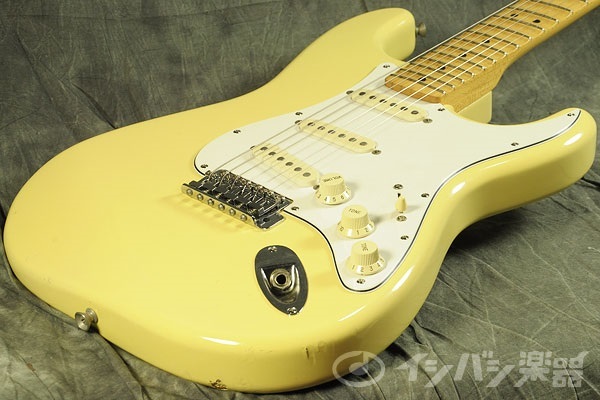 Ishibashi's U-Box had a Mexican-made Fender Ritchie Blackmore signature Stratocaster for ¥84000 or US$690 at the prevailing rate. Which was a bargain considering that a new one sells for ¥165000 or US$1350 on the Ishibashi site. I must admit that I have long gotten over my Mexican vs Japanese vs American biasness when it comes to guitars. My Mexican-made EVH Van Halen is a good case in point -- it plays amazingly well and the workmanship is top-notch. A lot of great guitars are coming out of Fender's Ensenada, Mexico plant these days. But as with most guitars on the U-Box that are a great value, the Blackmore signature was snapped up quickly by another customer. Beat me to it. Foiled. Dang. So continue browsing I did. I noticed one particular guitar, listed as 'ST72-80SC YWH Mod' had been languishing on the U-Box site for a couple of weeks. From the model number I could tell it was a Japanese '72 reissue Fender Stratocaster, but what was with the 'SC' delineation? 'SC', it turns out, denoted a scalloped fingerboard, which meant that this particular guitar was an Yngwie Malmsteen signature model of some ilk. 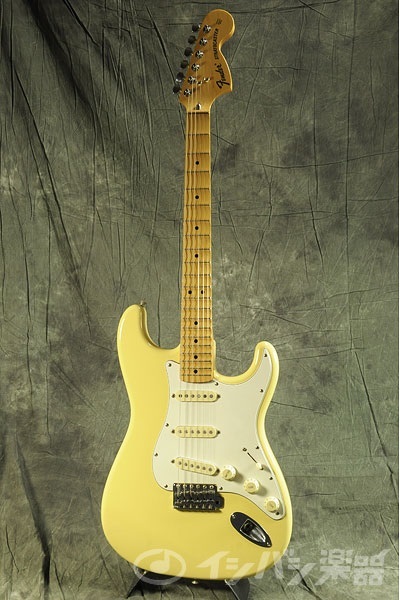 Fender only ever produced scalloped fingerboards on two of their artist's models -- the Ritchie Blackmore signature, which came with an asymmetrical, gradated scalloped rosewood fingerboard, and the Yngwie Malmsteen signature models which came with evenly scalloped maple or rosewood fingerboards. I wasn't sure if I was ready to bring a Malmsteen signature Strat out on gigs, since I don't associate my style with Yngwie's by any stretch of the imagination. You know how it is -- whip out an Yngwie Strat and people immediately start wincing, in anticipation of a barrage of swept arpeggios and a flurry of 16th note triplets. But a Strat is a Strat, is a Strat, right? Whatever that means. My consolation was that the ST72-80SC YWH lacked the ubiquitous Yngwie signature at the headstock, found on all Malmsteen models. So for all intents and purposes, other than the scalloping, it was a just another blond, large headstock 70's style Strat. And like the cherry on an ice cream sundae, that chrome bullet truss rod nut looks very cool. And you don't have to pop the neck to do a simple truss rod adjustment. Listed at ¥60000 or US$493, I thought it was pretty good deal. Actually, it was an amazingly good deal. And why no one had jumped on it so far, I just couldn't figure. So off went my ever hopeful email to Johan Lindh at Ishibashi who handles all the English correspondences with overseas customers. available for this item, and information on how to order. Basswood body, 1p Maple neck / fretboard. Scalloped fretboard. Neck pickup is a non-original Fender USA 016730 and the switch has been replaced as well. Overall scratches and dents. Larger dents and chips in the lacquer/wood. No playability issues. Frets, truss rod and neck in good condition. Wonderful. It hadn't been sold yet. And seeing as how it was built between 1993 and 1994, this guitar, as of this writing, is 21 or 22 years old! But the basswood body, I'll admit, I wasn't too thrilled about. The wood snob in me was hoping that it was alder, the standard body wood for Stratocasters. Basswood is softer than alder, which, to my ears, gives more of an emphasis around the lower midrange. Alder is a harder wood and sounds a little brighter and springier. But since this was an all-maple neck, I reasoned that the basswood body would balance off nicely against the maple, tone-wise. And we've all played Strats with the alder body and maple neck combo that sounded a little too bright haven't we? See, if you set your mind to it, you can rationalize almost anything. The guitar shipped out from Tokyo International last Saturday, October 31st, and was at my doorstep on Tuesday evening. Or rather, the postman was at my doorstep with a large Ishibashi carton on Tuesday evening, with nobody home to receive it. I immediately had a flashback of my last Ishibashi order, the Tokai L173. And like that last experience, the postman rang me on my mobile and sounded a little disappointed when I told him no one was home. He then told me that he had to go back down 14 floors to the van to get a delivery notice to slide under my door. What? You mean you don't carry around a bunch of those in your pocket just for these instances? But of course I didn't tell him that. I didn't even dare suggest it. The last thing I wanted is for a disgruntled postal worker to hurl my precious Fender ST72-80SC -- SC mind you -- into the back of the van in a huff. Yeah, I'm paranoid that way. And what do I find when I get home? A crumpled delivery slip jammed in the handle of my front gate. What happened to putting important documents into the mailbox or slipping it under the door where no one can get at it? Wake up, SingPost! The next day, with delivery slip in hand, I made my way down to my neighbourhood post office in the afternoon to pick up my guitar. The young lady who assisted me had some trouble finding the carton in the backroom, walking back to her workstation a couple of times to re-check the shipping number. 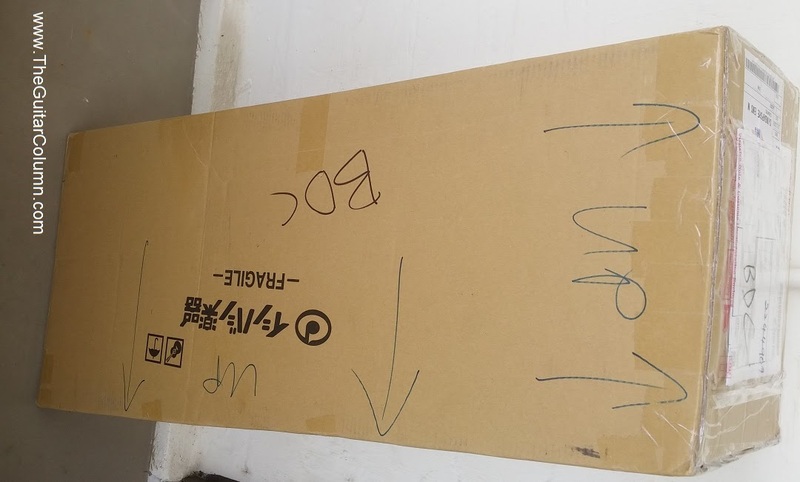 She left the door slightly ajar as she went back to search for the third time and through the crack I noticed the Ishibashi logo emblazoned on a carton standing against the back wall. I found it a little strange that she told me in Thai to go to a security side door where she could hand the carton over to me. Stranger still that I actually understood her. A new guitar will do that to ya. The carton looked very well packed and felt well-padded from the inside so I decided against asking for a pen knife to check the contents for damage. I also didn't want to draw the attention of the somber looking people queuing to pay their bills and traffic fines by whipping out an ostentatious scalloped blond Fender Stratocaster in their midst. Guitar in carton under my soon-to-be aching arm, I trudged my way home, stopping for a leisurely sushi lunch along the way. My self-restraint these days is amazing. In my impetuous youth I would have hopped into a cab, ripped open the carton with my bare hands and teeth in the backseat, tuned the guitar and then enthralled the cab driver with the plinkety-plink of my hottest licks along the way. When I ordered the guitar, I expressed to Johan Lindh at Ishibashi that I needed the guitar to be very well packed since it had to endure a long trip in a softcase all the way from Japan. And also that SingPost could at times be quite rough in handling items. He told me he would take care of it and pack the guitar personally. And man, did he oblige. He bubble wrapped the guitar thickly in its softcase, enclosed it further in a cardboard frame and placed it snugly into the carton surrounded with lots of packing paper. The guitar would probably have survived a drop from the cargo hold of a plane at take-off. And this, ladies and gentlemen, is how you properly pack a guitar for shipping. The guitar arrived strings loosened and in perfect condition other than the dings and dents on the body as Johan had described in his email. On closer inspection, the few dings didn't look too bad, considering this guitar is 22 years old. They add a bit of real vibe and character unlike the faux scrapes, scratches and dents you find on the relic jobs coming out of the Fender custom shop these days. Two dents on the lower bout. No fake relic'ing here! Surprisingly, the entire neck of this guitar is in pristine condition with nary a scratch or even a spot of wear. Even the top edge of the headstock, where most guitars of this vintage would at least have a couple of battle scars, is absolutely immaculate. 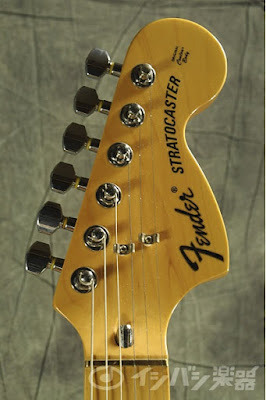 There is also almost no fret wear on the thin vintage-style Fender frets, and neither has the shiny brass nut lost any of its luster. Amazing. The previous owner really took care of this instrument. The setup guys at Ishibashi had strung the guitar with fresh .009 - .042 strings and adjusted the neck nearly straight with a hair of relief at the seventh fret and also adjusted the intonation. Interestingly, they had set the tremelo bridge so that it sat flush against the body, which is how I always set up my Strat bridges. This allows for maximum transmission of tone from the strings to the body and the guitar doesn't go wildly out of tune if you break a string. What I found a little odd though is the extreme angle the tremelo arm sits when it is screwed into the bridge -- it points up at nearly a 45 degree angle relative to the body. I guess I'll have to bend it back to a more reasonable playing position. Stay tuned for my next post where I peer under the hood of this Yngwie Malmsteen Stratocaster to check out the internal wiring and pickups. I might even install a set of KTS titanium saddles for good measure.